We wrote about ingenious bike/stroller hybrid Taga three years ago, but we took a second look due to its recent, renewed viral internet fame. After GI Gadgets posted a video of Taga in action a few days ago, more than 61 million people have tuned in to see this transportation combo in action. So many people liked what they saw, Taga sold out of two months of inventory in 72 hours and the company's website crashed. Everything old is new again in this case, but we took a closer view this time to discover what exactly makes this inventive mode of transportation so popular now -- and why it may actually be worth the steep price tag. The allure of Taga is instantly evident, especially for parents who love to bike or who want to add some physical activity into the daily family routine. You can switch between bike and stroller modes in about 20 seconds, making seamless transitions from biking to the grocery store and then carting your kid around. Inspired by the three-wheeled bikes called “bakfiets” that are ubiquitous in the cycle-crazy Netherlands, Taga combines the luxe features we have come to expect for baby strollers with the convenience of a multi-terrain cargo bike. Taga has a longer lifecycle than most strollers, and you can replace kiddie seats with a large cargo basket for when tots are big enough to bike alongside you. There’s even a double seat stroller option as well as a rain cover, mudguards, side bags, and reflectors if you are biking at night. We love how easily the stroller converts to a bike and vice versa, making it multi use and perfect for those days when we mix errands and must-dos with playtime and fun (which is pretty much every single day). Jogging strollers make it easy for runners to cart their kids around town in an eco-friendly way, but Taga invites cyclists (whether they are casual or devoted) to get in on the hybrid action. The three-wheeled design offers extra support and balance, making cycling doable even for parents who aren’t the most confident bicyclists. Biking with the wind rushing at you is such an exhilarating feeling, and little ones can catch the buzz while watching from a safe perch between their parents arms at a higher level than most other cargo bikes. 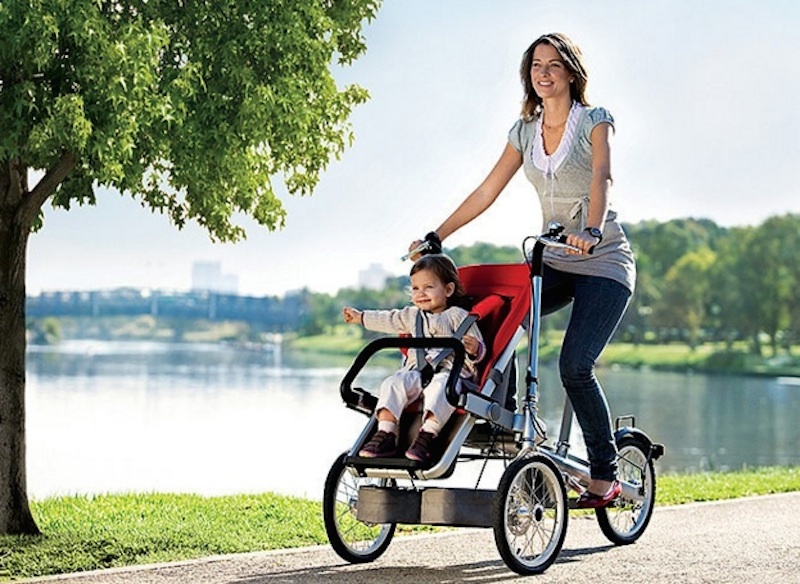 Taga can hold a child 6 months to 6 years (and up to 54 pounds) in bike mode and up to 33 pounds in stroller mode. The only bad news about this hybrid? Taga comes with a steep price tag of $1,495. The good news? Taga 2.0 will be launching soon, and the company promises this version will be much more affordable. The allure of Taga is instantly evident, especially for parents who love to bike or who want to add some physical activity into the daily family routine. You can switch between bike and stroller modes in about 20 seconds, making seamless transitions from biking to the grocery store and then carting your kid around. Inspired by the three-wheeled bikes called "bakfiets" that are ubiquitous in the cycle-crazy Netherlands, Taga combines the luxe features we have come to expect for baby strollers with the convenience of a multi-terrain cargo bike. Taga has a longer lifecycle than most strollers, and you can replace kiddie seats with a large cargo basket for when tots are big enough to bike alongside you. There's even a double seat stroller option as well as a rain cover, mudguards, side bags, and reflectors if you are biking at night. We love how easily the stroller converts to a bike and vice versa, making it multi use and perfect for those days when we mix errands and must-dos with playtime and fun (which is pretty much every single day). Jogging strollers make it easy for runners to cart their kids around town in an eco-friendly way, but Taga invites cyclists (whether they are casual or devoted) to get in on the hybrid action. The three-wheeled design offers extra support and balance, making cycling doable even for parents who aren't the most confident bicyclists. Biking with the wind rushing at you is such an exhilarating feeling, and little ones can catch the buzz while watching from a safe perch between their parents arms at a higher level than most other cargo bikes. 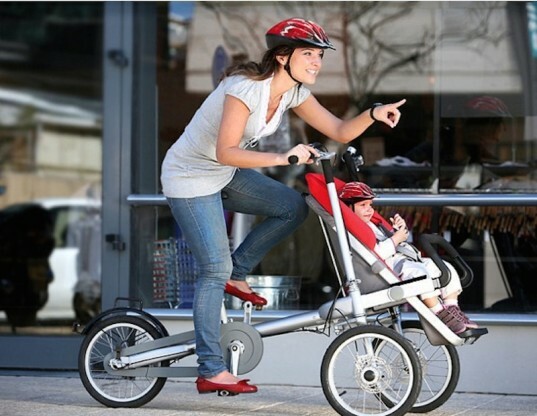 Taga can hold a child 6 months to 6 years (and up to 54 pounds) in bike mode and up to 33 pounds in stroller mode.